Hearing Facebook and D365 in the same sentence initially makes me wince a little, but it makes perfect sense. Facebook is in the business of user interface on the web, so why would Microsoft reinvent the wheel for user interface when the engineers at Facebook are leading the way and devoting more resources towards it? 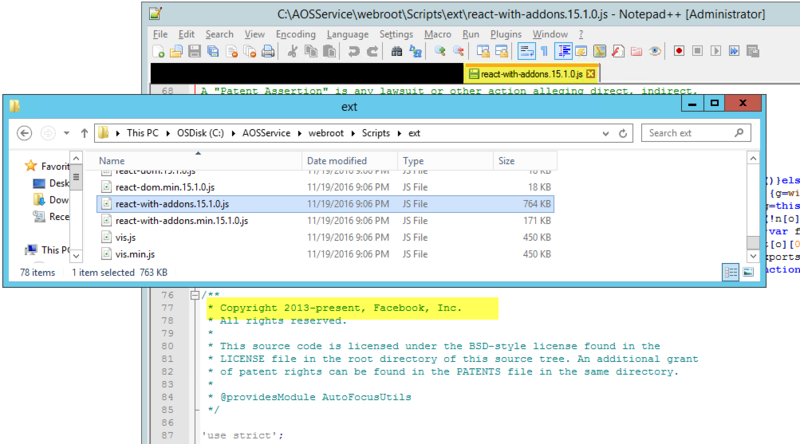 You can see the React JS files in various locations, such as C:\AOSService\webroot\Scripts\ext\react*.js on a demo VM. As of writing this, the current version embedded in the Nov 1611 VM is 15.1.0 while the available is v15.3.2. So if you're experiencing bugs with some controls, there may be a fix on the horizon.